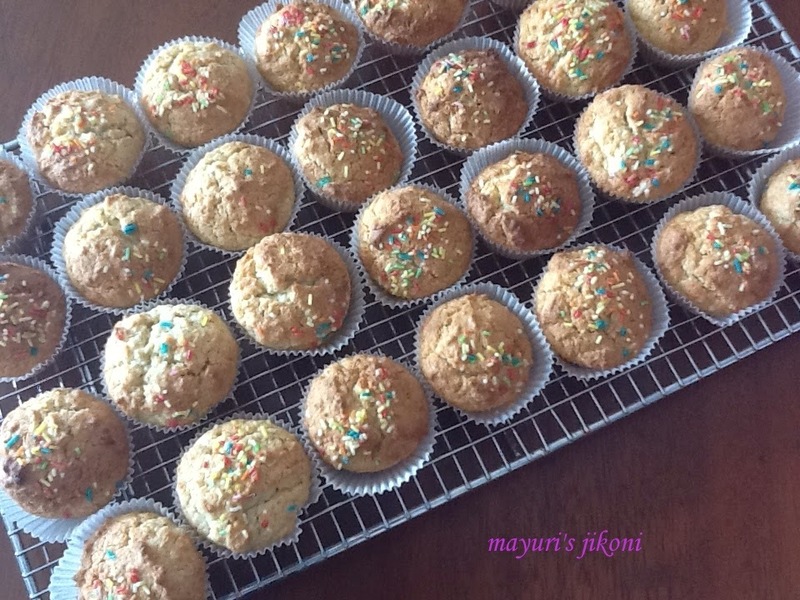 The first time I realized that cupcakes can be eggless was when I helped Nunu to make the coconut cupcakes. In a houseful of guests and little kids, we used to bake loads of these cupcakes. Dunked in tea,coffee or milk they taste amazing. We have baked these cakes for various occasions right from birthdays to offerings at the temple or religious gatherings. They tend to taste much better the next day. Nunu baked them with me twice and after that, it was my job to bake the cupcakes and she would take care of lunch or dinner. Baking these delightful cupcakes for a religious occasion is a joy, a sense of happiness during birthday parties and something different for festivals. Pre heat the oven at 180° C. Put paper cups in a muffin tray. Sieve the flour and baking powder together. Add the coconut and mix well. Keep the mixture on one side. In a bowl mix sugar and butter till it is light in colour and fluffly. Add the milk, colour and vanilla essence to the creamed sugar and butter. Mix well. Add the flour mixture and lightly fold into the creamed mixture. Spoon the batter into the cups three quarter of the way. Bake in the oven for 20 to 25 minutes until the tops are golden brown and when you prick a toothpick or fork into the cake it comes out clean. Remove from the oven. Remove the cupcakes from the muffin tray and let it cool on a cooling rack. Self raising flour is not readily available in India. Just sieve together 120 g of plain flour and ½ tsp of baking powder. Then follow the recipe using the additional baking powder. Can add ½ a cup of chocolate chips, glaced cherries, blueberries, nuts or raisins to the recipe. You can avoid the colour if you like. It will make the cupcakes appear pale in colour. Can sprinkle silver, gold balls or sprinklers on the cake before baking. If the cakes are not done within 20 to 25 minutes then lower the temperature and bake. Temperatures tend to vary in most ovens.